i hope everyone will pardon another of my occasional digressions from thai music today, but i wanted to give a heads up to all n.y.-area readers: the legendary 70's burmese "stereo" star khine htoo will be performing in the city saturday, june 30th at the laguardia performing arts center in long island city. he will be joined by tin zar maw, chaw su khin & supan htwar for their "3 generations tour u.s.a.". 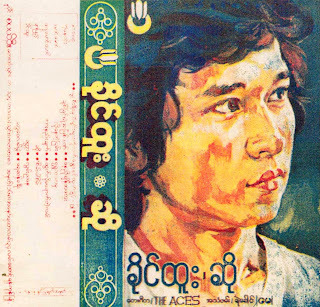 khine htoo was among a handful of pioneering rock stars who won fame in the 70's & 80's for penning original compositions, or "own tunes" (the majority of burmese popular music consists of foreign cover songs) which he performed with his bands the phoenix and later the aces (who back him on this 1981 cassette). all credit to dr. lun swe for originally sharing this classic recording at his blog. enjoy! Uh, we HAVE to go to this, yeah? definitely. i have some things to figure out, though.. we will be in contact! y'know paul, i did see clips of a sydney performance from several years back while i was doing research for this post. worth keeping an eye out! Oh my gosh, this is great! Thank you, Peter.